Make thehosepipe a tightfit by jamming it inwith rags. Flush the water through until it runs out clear. 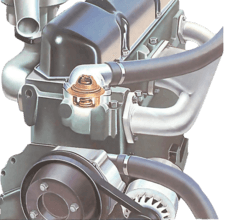 If your engine is overheating and you have eliminated other possible causes, such as leaks (See Adjusting the static timing), the water passages are probably choked or narrowed by sediment. To clear them, thoroughly flush the radiator and engine. Check whether there is any risk of wetting electrical components, including an electric cooling fan. Protect such components by covering them with a plastic bag. It is vital to do this before rinsing dirt from the outside of the radiator. Use plastic bags to cover the nearby electrical components. Before flushing, drain the old coolant from the system and discard it the sediment deposits will have contaminated it. Remember, however, that the antifreeze contained in the coolant is poisonous. Have a large container ready to collect it, for disposal later at your nearest dump for poisonous wastes. Fully loosen the hose clips and pull them back along the hose. Pull off the hoses taking care not to strain the metal stub pipes. Check by catching some water in a glass jar and looking for sediment which you can see only in still water. If the water does not clear in a few minutes, reverse flush the radiator. Seal the hose into the bottom stub. Tie a long plastic bag with a hole in the bottom to the top stub, to direct the coolant away from the engine and electrical components. Flush until the water runs clear. Turn the removed radiator upside-down or stand it on end so that you can flush it in the reverse direction to the normal flow. Tilt if necessary to bring the outlet to the lowest point. Prop it upside down and seal the garden hose into the bottom stub, which is now at the top. Flush hard until the water runs out clear. Seal a garden hose into the housing stub. Flush until water runs clear from the bottom hose. 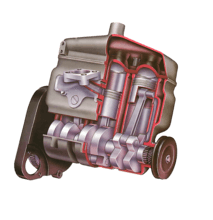 This is reverse flushing: water normally flows up the engine. Refit the radiator if you removed it, and put back the thermostat. Fit a new gasket in the thermostat housing, after smearing both sides of it with non-setting sealant. Bolt back the top. Add antifreeze (See Checking and topping up car antifreeze coolant) only when you are satisfied that there are no leaks. 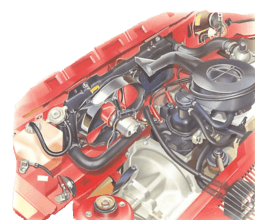 The coolant mixture is usually good for two or three years' winter and summer use, after which it should be replaced. Protect the electrics, then hose water through the fins from back to front.